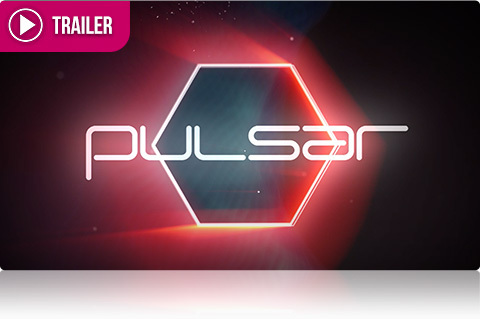 A deep and futuristic collection of sounds perfect for modern electronic producers, composers and sound designers - Pulsar delivers powerful bass, electrifying leads, sunken and winding atmospheres, otherworldly pads, effects and more. Designed and developed by Richard Gale and Carlo de Gregorio, the sounds of Pulsar are rich, detailed and unabashedly modern with electronic timbres ranging from flowing analog-inspired leads to immersive granular soundscapes. 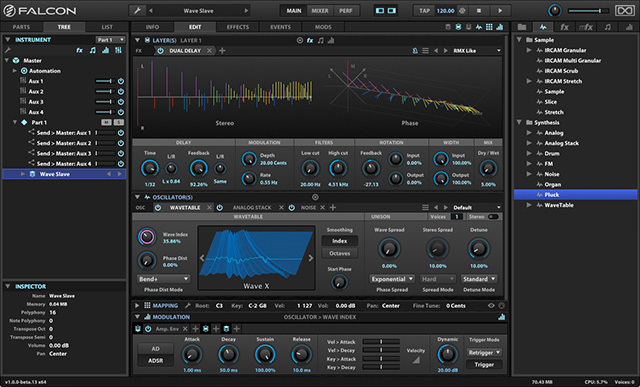 Pulsar delivers powerful fundamentals and charactered sounds in categories including atmospheres, bass, effects, leads, pads, plucks, sequences and arps. Each of the sounds in Pulsar is designed to be expressive and playable, providing unique controls and macros allowing you to sculpt your sound and create dynamic performances. Dedicated ADSR envelopes, filter and effect macros and more make it quick and easy to perfectly dial-in your sound. The versatility and clarity made possible by Falcon is evident throughout this collection, utilizing numerous synthesis techniques including wavetable, virtual analog and physical modeling, as well as robust use of effects and modulators. Sounds can all be quickly previewed, edited, layered or performed with nearly limitless variation thanks to Falcon's semi-modular architecture. 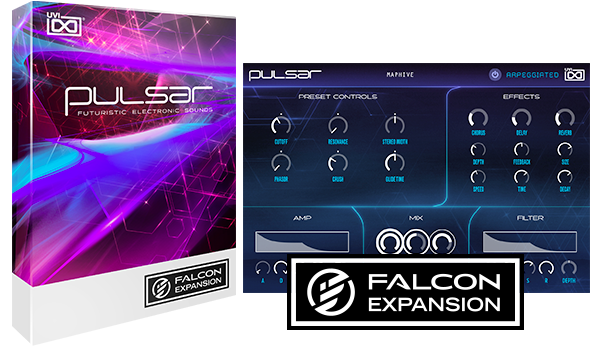 The Pulsar expansion leverages the advanced synthesis capabilities and software architecture of Falcon, which sports 15 oscillators, over 80 effects and a fast and intuitive interface that adeptly handles both basic tasks and deep instrument design. All presets have been programmed with macros which provide the user with easy access to the key parameters of each patch. These may be controlled via MIDI, OSC, host automation and Lua scripting, allowing for easy customization and expressive performance capabilities. >> Download "Pulsar Manual" >> Download "Falcon Expansions Installation Guide"